Getting Ready for Harpoon’s Public Launch! We’ve been working on a huge update to Harpoon and it’s almost ready for our official public launch. It includes a sea of improvements and new features including an updated dashboard, invoicing, estimates, recurring billing, time tracking, revenue tracking, project and client history, and financial goal-setting. Interested in giving it a try? Read on and dive into the details. Let’s talk details and look at pretty screen shots. Over the winter we released the first version of Harpoon to a portion of our mailing list. We wanted to make sure we were heading in the right direction. After months of feedback (thanks! ), fine-tuning, adding features, and removing features, we’re just about ready to open the doors to a public launch. Let’s take a peek at what this new version of Harpoon looks like, then we'll talk about what it all means to you. The heart of Harpoon’s interface will continue to be its Dashboard. The Dashboard showcases over a dozen crucial metrics to help you understand the health of your business. 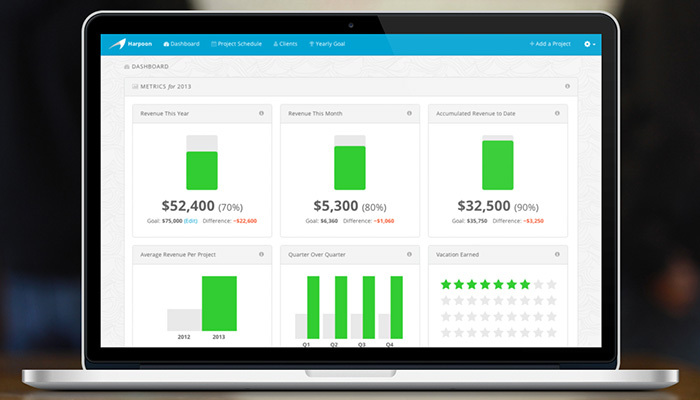 Everything from tracking revenue goals and vacation days earned, to revenue forecasting and tax estimates, the Dashboard gives you the big picture view of your freelancing finances. 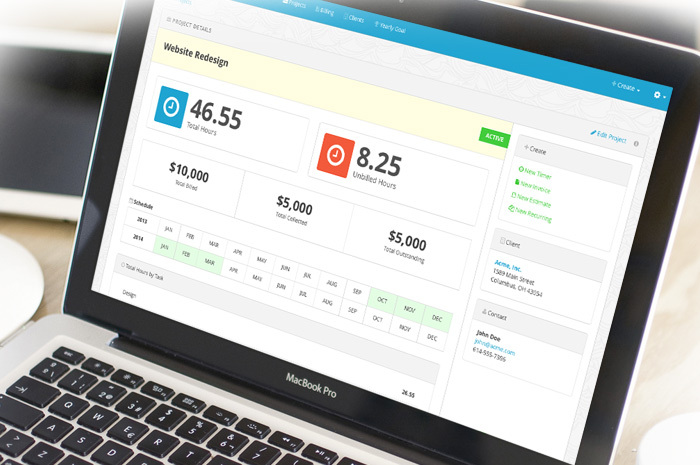 At its core Harpoon helps you determine a specific yearly revenue goal for your business. This goal is based on a budget that encompasses the lifestyle you want to live as a freelancer. Everything from your office, meals, and transportation, to health insurance, vacations, and retirement savings, Harpoon helps you set meaningful revenue goals based on your real life. No more guessing how much you need to make. 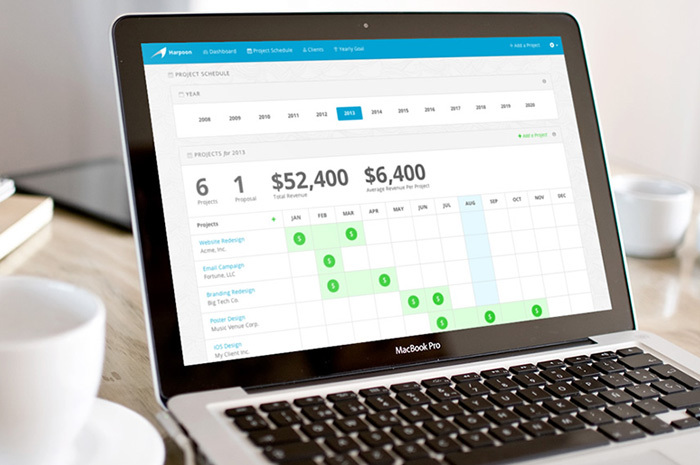 Beyond simply scheduling your client projects, Harpoon’s Project Schedule provides a revenue-focused, year-at-a-glance view of how your project revenue stacks up on the calendar. It breaks down your yearly revenue goal into smaller bite-sized goals, and automatically tracks your accumulated progress toward those goals. You'll see exactly how much you need to make each month, each quarter, and where to schedule new projects based on your financial goals for the year. 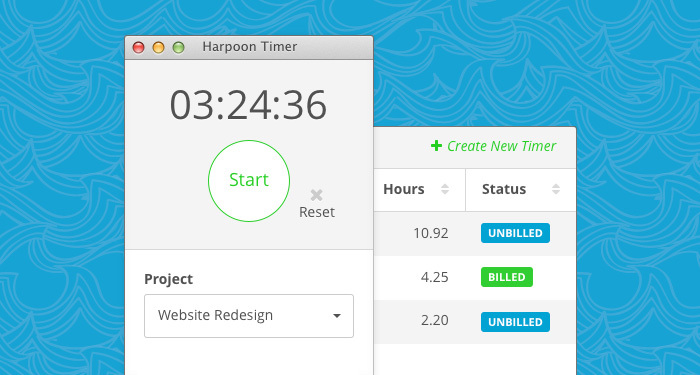 Harpoon makes it a breeze to track, log, and categorize the time you spend on your clients' projects. Want to bill for that unexpected meeting you got pulled into last week? 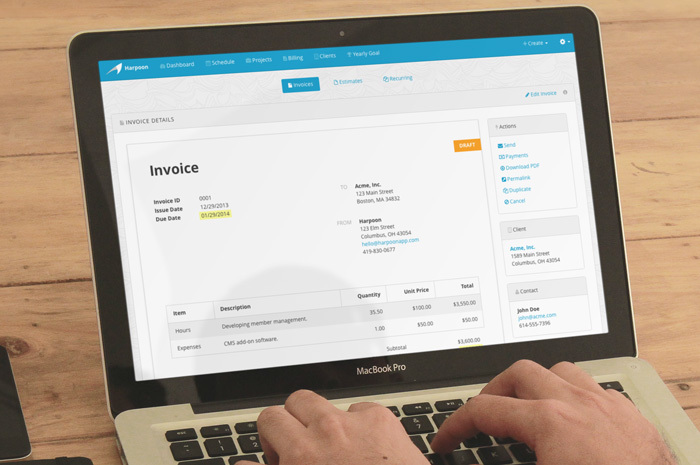 With just a few clicks you can send your recorded hours directly into an invoice. You'll have a neat and tidy record of the time you've billed vs. time left unbilled. 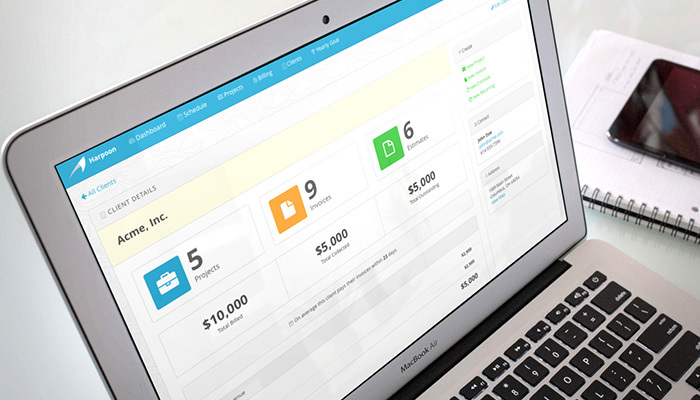 Harpoon provides all the features you need to bill your clients and get paid quickly. 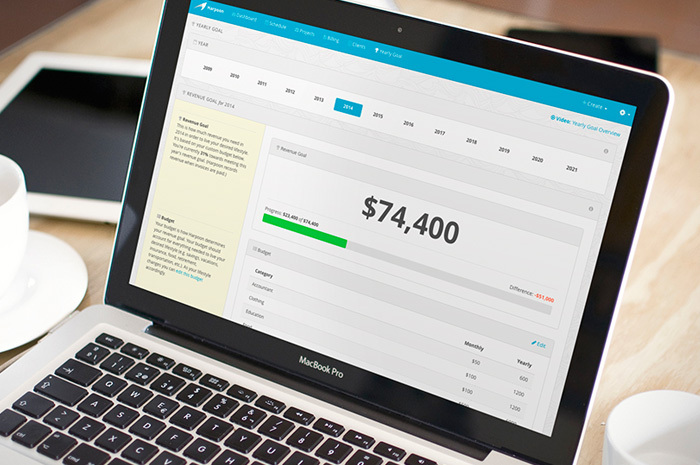 Deliver estimates for your projects, send invoices, or set up recurring invoices that get sent and paid while you sleep. You'll know when a client has viewed an invoice, and your clients will appreciate the one-click ease of making payments online. Harpoon's invoices are clean and beautiful, a perfect complement to the professional services and products you provide. It can be difficult to keep track of a project's financial details when those details are scattered across multiple estimates, invoices, expense tables, time sheets, etc. Harpoon gathers those details for you and packages them in a stunning layout providing you clarity into each project's financial status and history. Harpoon provides a unique, historical view of each of your clients. All of the financial data surrounding a client is gathered together and presented on a single screen. Without having to dig you’ll immediately know which of a client's projects are active, what invoices are outstanding, which estimates have been approved, and what kind of historical revenue your client has contributed to your business. Our Harpoon mailing list subscribers will soon be receiving a unique discount code. It'll include a free trial and a discounted subscription to Harpoon. So be sure to get on the list now if you’re interested in taking Harpoon for a spin. Our goal at Harpoon is to help freelancers take control of their finances, make more money, and eliminate some of the stress involved with running your own business. We hope this new version of Harpoon is a big step towards helping you accomplish just that!